Simplicity, comfort, and concealment in a compact lightweight design. The ambidextrous Cargo Pocket Holster fits the thigh pocket of most cargo pants/shorts. This carry option is great for when you just don’t have room in your regular pants pockets for a pocket holster. Positions your handgun for fast access when you are driving or sitting. The holster can also be placed in-between your car seat and center console for fast access to your gun while driving. Great for fast access in women’s purses. The Cargo Pocket Holster holds your gun in an upright position with the grip of your gun at the top of the pocket for a fast draw. Design allows a firm two finger combat grip on the gun for a controlled draw. 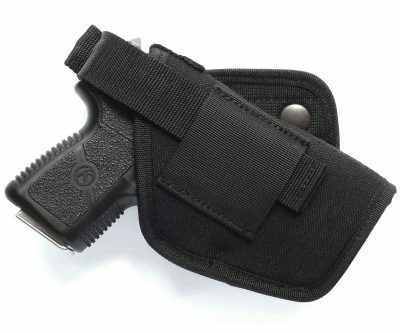 Carries an extra magazine that helps support the holster to keep it upright in oversized pocket. Disguises the shape of the gun in your pocket so it doesn’t look like a gun. Constructed from high-tech closed-cell, waterproof foam padding for a comfortable carry and to protect your gun from moisture. Lined on both sides with Cordura® nylon for durability and an easy, fast draw. We use only the finest bonded nylon thread and all stress points are double stitched for extra strength and durability. This foam, with time and usage, conforms to the shape of your gun giving you a custom fit holster. This special material is made exclusively for Active Pro Gear. This card reveals, step-by-step, exactly what to do after the confrontation ends and the confusion begins. It contains vital information to protect you! If you carry a gun for protection, you can’t afford to be without this card. Get your card absolutely free, just by trying the cargo pocket holster—at no risk to you! I live in south Florida and wear cargo shorts every day. This holster is absolutely perfect. My Taurus TCP and its spare mag fit snug in the holster and there is no printing whatsoever. The material is heavy and durable. It’s a home run for me. Fits my Kahr CW40 and my cargo pant pocket perfectly. Fits my shield with extra mag great, stays in pocket and affordable. So far so good. Product is well made. Based on the other reviews I see here I guess my cargo pants are smaller than theirs. With my M&P 40 and a spare mag it will not fit in my pocket. Taking out the spare mag I can force it into the pocket but then you have the weight of the pistol slamming into your leg every step that you take. Glad it worked well for others. Holds my XDS 45 extremely well. Would recommend it to all.